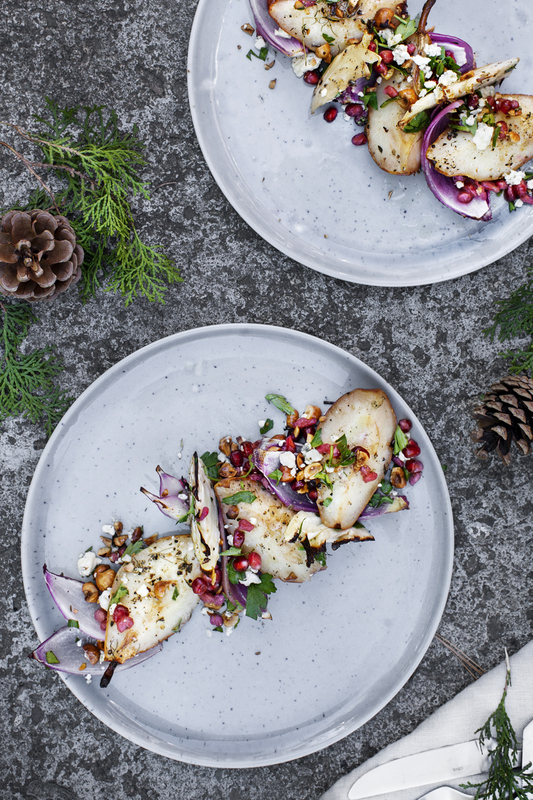 A warm pear and fennel salad with hazelnuts and blue cheese. Perfect with any and all Holiday Meals: being it duck, turkey, goose or a leg of lamb. With all the textures and flavors, crunchy, soft, strong, mild, salty and sweet this salad might just become your favorite of all time. 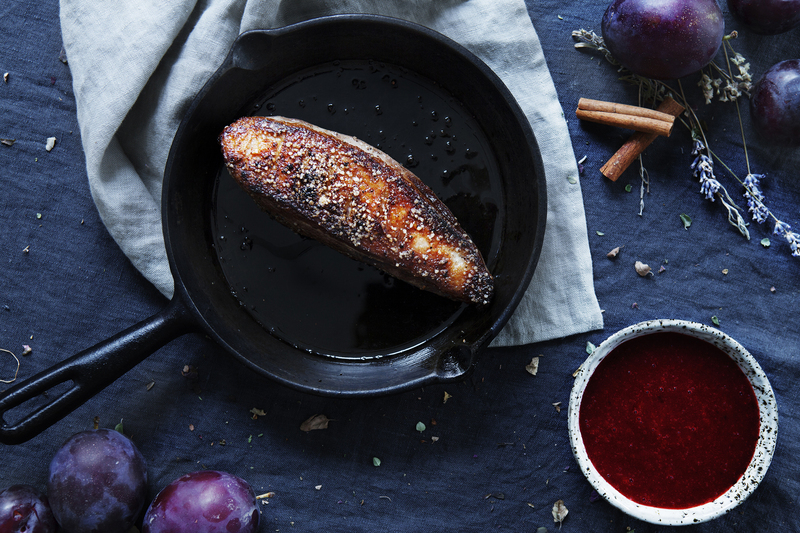 Need some more inspiration for a Holiday Side dish? Check out my Citrus and Fennel Salad for freshness and my Apple Chutney Recipe for warmth and spice. Chop pears, onions and fennel into similar sized wedges and place in an oven proof dish along with bay leaves and thyme sprigs. Drizzle with olive oil and vinegar. Sprinkle with sage, salt and pepper. Roast the veggies in the oven at 180°C (355°F) for 25-30 minutes or until fennel and onions have softened. Place the hazelnuts on a baking tray and roast in the oven at 180°C for 8 minutes or until darkened and fragrant. Remove their skin by placing the warm nuts in a kitchen towel and rubbing them together. Chop roughly and set aside. 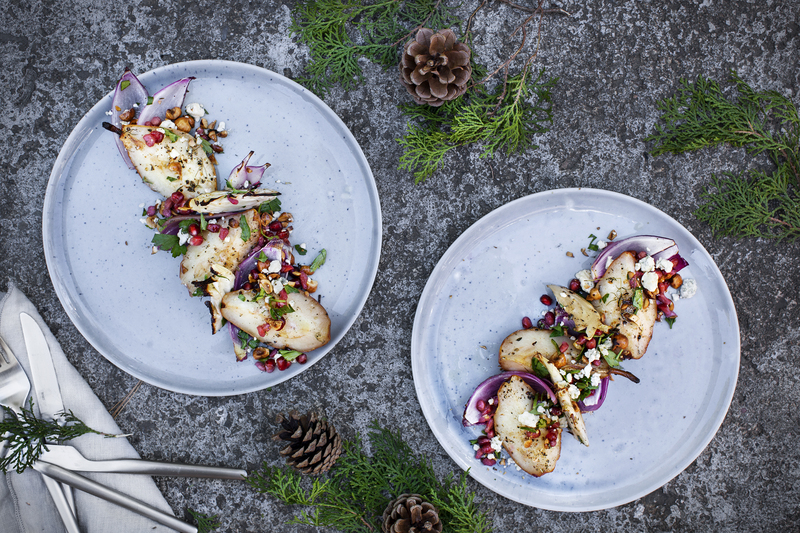 Arrange the warm pear wedges, onions and fennel onto plate(s), sprinkle with pomegranate seeds, parsley and blue cheese. Drizzle some of the liquid from the oven dish over.